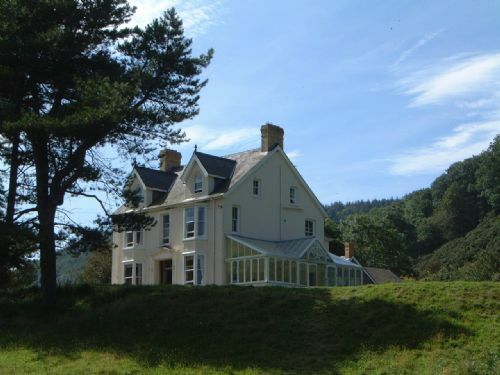 Nestling within a beautiful valley, just 500 yds from Cwmtydu beach, the splendid, former gentlemanâ€™s country residence stands in 2.5 acres of lovely, lawned gardens. Enjoying outstanding views of the sea, it is spacious and comfortable and is perfect as an unforgettable venue for family holidays. eaturing two lounges, one complete with a piano, a large, sunny conservatory and a games room with pool table. With wonderful walking from the door along the Ceredigion Heritage Coast is only 1.5 miles from a shop and pub. Locally there is a wealth of activities for all ages to enjoy, with horse riding, sea and fresh water fishing, canoeing, golf, bowls, tennis, quad biking and a dry ski slope, all within easy reach. Snowdon, Tenby and the Gower Peninsula are all within driving distance. Ideal for large family groups or reunions, Park Hal is a perfectly placed base. We all had a wonderful time at Park Hall. The location is stunning with only a short walk to the beach (5minsTops). The house was spacious and had a lovely Edwardian ambience. The kitchen was well equipped plently of crockery, cutlery and glasses. There was 3 fridges but only 1 medium freezer. The bedrooms were clean and spacious with very cumfy beds. There were 20 people in our group and the house accomodated us amply. We had a lovely family get together for a Ruby Anniversary. Age range from 91 to 6. Children enjoyed the piano and Pool table big hit with all. Even though the kitchen was very well equipped it is very small for this size of house. The view from house is stunning also the grounds. This was booked for a family of both adults and children and was the perfect house to stay in. With en suites in nearly every room you felt comfortable in that you weren't sharing with anyone. Great WiFi also in the house. Perfect place for a family get together. Loads of space. Lovely big dining room overlooking garden and sea. Children loved the garden and even persuaded some adults to rolypoly down the bank. Setting worked perfectly for fireworks too. Just a short walk to see seals on the beach. Cliff walk into New Quay was an adventure including getting the bus back, singing along with the driver and co. Roger and Carol were excellent hosts, thank you so much. Park Hall is a comfortable, well equipped house. It Is spacious enough to accommodate our extended family of 20 in comfort. It is a real home from home. The setting is superb, just a short stroll from the cove and the garden is great for the children to enjoy games of football,cricket etc or just to relax in. Something for everyone. There are some beautiful beaches just a short drive away. Llangranog was a favourite. The whole family arrived. Sixteen of us plus baby. Plenty of room and space. Games room very popular. The large table in the conservatory proved ideal for games as well as meals. Outside is delightful. The dogs had a great time. Park hall is a wonderful place to stay. Lots of space and beautiful surroundings. The cove is only 2 mins away with a lovely little cafe. Really recommend this place. Fantastic country house with a short walk to pebble beach. Ideal for the coast path and large family gatherings. A fantastic break was enjoyed by a large group of families, gathering to celebrate some special birthdays. Roger and Carol were hugely welcoming and helpful, while remaining inconspicuous during our stay. Park Hall is a beautiful house, set in gorgeous grounds and has the most amazing views down the valley to the sea. The house is very well equipped and the conservatory was perfect for our large group to enjoy sociable meals together. We were lucky with the weather while we were at Park Hall, but even if it had rained every day the games room would have easily kept us all occupied. The children and dog loved the fact that the beach is only a short stroll away. The locality is lovely. Roger and Carol provide really helpful information about the area. We enjoyed exploring New Quay, dolphin and seal spotting (you can see the house from the boat!) and walking the coastal path. We are already planning our next visit! We are a group of middle-aged walkers walking the Coastal Path (south to north). We enjoyed the comfort and the situation (and the orchids). Our holiday party of 20 found Park Hall a perfect base for a week of family visits to beaches, castles and relatives. The large conservatory with its magnificent table was perfect for several great family meals. Whilst the kitchen was small it accomplished, along with a variety of chefs, many large succulent meals, enjoyed by all. The owners are in the process of selling and hopefully the new keepers will maintain the property in the rental market as this is too good a setting not to be enjoyed by many others. A fabulous house set in wonderful grounds, perfect for myself and our extended family.....10 adults, 9 children and two dogs!! The bedrooms were ample and comfortable and it was only a short walk to a pebble beach and costal walks. I would highly recommend to all. An unforgettable week spent at Park Hall. The house was spacious to absorb up to 16 people easily with two very comfortable lounges and a conservatory for dining in with a beautiful outloook onto the grounds and down to the beach. It was warm, comfortable and made especially welcoming and seasonal with the Christmas tree and decorations for this time of the year! The games room was another great feature, enabling us to spend many hours playing table tennis / pool tournaments! The house is set in the most picturesque spot and we loved the easy access it gave to the Ceridigion Coastal Path as well as to the sea itself. There is no phone signal but we found that a blessing rather than an inconvenience! However, there is WiFi at the property. The bedrooms were comfortable and roomy and most have en-suite facilities. We would highly recommend Park Hall as a great place for family get-together or specIal events. We certainly enjoyed every minute spent there over the Christmas week, 2017.
very pleased on our third visit, will hopefully return in the future. the owners are very helpful and considerate of our needs. We all enjoyed our stay at Park Hall.The garden was great for the children's activities and we were blessed with good weather for cliff walks.The games room was well used at all times.We saw the seals in the Bay and visited the cafe.We really appreciated the lovely dining room . This property was ideal for our family party of eight adults and nine children aged between four and eleven. With comfortable bedrooms and lounges, and with a huge garden and fabulous views, the highlight inside the house was undoubtedly the large dining room/conservatory, where we enjoyed lengthy evening meals, and which looks over the garden. We were all new to the area, and were very impressed with the beautiful coastline and peaceful inland lanes and villages. The kitchen was very well equipped. Table tennis and pool provided good competition! This place is special and is highly recommended. Great space for an extended family holiday in a beautiful location. We particularly liked being able to walk to the beach and on to cliff paths, lovely big garden, well supplied for catering for large groups. Perfect setting for family party. Roger and Carol were waiting for us on arrival and welcomed us showed us round and made sure we were happy with everything . The house and the grounds suited our family group really well.The games room kept the kids amused along with running around the garden.The beach was only a short walk from the house and the sunsets were amazing . Beautiful location, comfortable accommodation, wonderful conservatory and grounds. We had a super w/end, blessed with good weather for walking, sea canoeing and generally pottering. Catering for 20, we found the small kitchen a bit of a challenge, but the pots ,pans, etc., were ample. Would certainly consider returning next summer. We stayed at Park Hall for 3 nights after Easter and had a fabulous time. There were 16 in our group of various ages - plus 3 dogs -and we all had a fabulous time. The house was very comfortable with a large garden and great views. Even though we were a large group you could always find a quiet space if you wished. We especially appreciated the large dining table in the conservatory and the games room. The only negative comment I would make is that the kitchen is very small and makes catering rather difficult- but this is out weighed by all the other positive factors. Park Hall is the ideal property for large groups wishing to be near to all the wonderful coastline views of Wales. It was in very easy reach of the coastline and offered our group with exemplary accommodation in an exquisitely delightful private setting. The owners were so wonderful too. We built some fond memories here and will be returning soon. Fabulous location close to the beach. Accommodation excellent with all needs catered for, the hosts were brilliant. We held my wife's 60th birthday party at Park Hall. It was perfect. A lovely house in fantastic grounds with loads of room for the children to run about. We had all age groups from small children to older relatives and it was ideal. plenty of space, lovely en-suite bedrooms, sitting rooms, good kitchen and a fantastic dining area in the conservatory. We could not recommend it highly enough. Wow, fabulously warm and cosy house even in February! Plenty of heating and hot water for our large party of 14. Extremely well equipped house with everything you could possibly need. Carol and Roger were very friendly and the welcome tray was a lovely touch. Everybody commented on what a great find the property was and great location just a short dawdle down to the coastal path for great walks in either direction we went to New Quay and the waterfalls on route were stunning. Kids loved the games room and Piano so plenty to keep all entertained. We all agreed would definitely use this house again and again! We booked the house at late notice and were really pleased with the size and facilities of the house, given we were 5 families some with small children. The fact that all the rooms except the bunk rooms had en suite was great. The large dining area worked well for group meals and the open fire in the lounge was cosy. The kitchen is small but had everything we needed plus there's a large pantry. No WI-FI really but that was just what we all needed. So secluded and quite. Easy stroll to the pebbled beach and we even enjoyed a New Years dip in the sheltered sea. Roger and Carol were helpful on arrival and we didn't need to speak to them again apart from to borrow some washing powder- thank you. Tesco delivered to the door no problem despite being down a track. We had a great time in a beautifully presented warm and cosy house with a fantastic location. Park Hall was ideal for our family group with its room and grounds near an attractive cove from where we saw seals and dolphins. Park Hall is a lovely big old house well furnished with big rooms and very welcoming for our week in late summer. The slightly small kitchen, though very well equipped with all facilities,is cosy when more than 2 people are catering, and beware the step. But so what? It was known about beforehand and doesn't detract from major enjoyment, just needs to be understood if limited personal mobility. It's a great place for quiet relaxation or active outdoor pursuits. It's got a (limited) bus service too! We had a lovely time at Park Hall. The Hall itself is a large building dominating the local environment and has 8 bedrooms seven of which had either a shower or a bath and a lavatory. We didn't like the electric pump in one of the main bedrooms as it was noisy if used at night. The kitchen is well equipped but a bit small and awkwardly placed for the main dining area which was in a large conservatory looking out onto a lovely garden which itself was ideal for the children to enjoy themselve running down a steep hill towards the sea. There was a games room and the children and some of the adults enjoyed playing pool which could be converted to table tennis . There was also a darts board but we didn't use this. The lounge was comfortable with a good sized television with free to view channels and rather hard to understand controls. The location was down a narrow road and access by a small bridge across a little river which provided a lot of fun for the dogs and children. The road ran down to a lovely cove with a stony beach and access to delightful cliff walks. We were a party of seven children and eight adults all of whom thoroughly enjoyed themselves. There was no mobile reception and limited WiFi (good). We've just spent a lovely family holiday at Park Hall celebrating dad's 80th. Beautiful house and grounds. There's plenty of space and facilities for large families of all ages to relax and enjoy. Large conservatory with seating for 20 was brilliant for us- likewise the large bedrooms and en suite facilities. Sand/pebble beach within short walking distance and access to coastal walks. Our thanks to Roger & Carol. We were a family party of 10 adults and 7 young children, the house was amazing and gave us so much space to enjoy. The children loved the garden and would be outside as soon as they woke in the morning. One of the best large houses we have found ! Cwmtydu bay was a short stroll from the garden and we saw a seal in the bay and dolphins from the coastal path, what more could you wish for. Our second stay at this wonderful, beautifully located house. A large family group with varying ages, we had a great time. The house is solid and noise does not travel, so when the little ones are up early it's still nice and quiet. We had rounders and football on the amazing grounds, and visits to the sea which is a very short walk away. The bedding is nice and there is more than enough crockery, cutlery for a large group. Thanks for a great holiday hope to return again. Park Hall was the perfect place for our family's celebrations - the owners were extremely helpful and welcoming and yet unobtrusive. The property was amazing and lacked for nothing, especially the kitchen which had everything that we needed and more to cater for our celebrations. The bedrooms and en suites were perfect and had a combination of beds to suit just about anyone. The games room was well used and only one 50p was required to work the pool table for the whole stay and the adjacent store room with extra fridge freezer was perfect as the alcohol store! The area is amazing and a 5 minute walk takes you to a lovely cove and the start of coastal walks in either direction. Newquay is only a short drive away and we visited on more than one occasion and did see dolphins jumping in the bay without the need for a boat trip. Beside the standard of the house and the well kept grounds, the large Conservatory was perfect for our celebrations and was well used by us both night and day. I can thoroughly recommend this property to anyone! Great place for a small crowd! You can make your own entertainment and have a party or barbque in the house in a great setting. We walked the coastal path to Newquay, the walk took an hour and half and the views were great, we could see the snow capped peaks of Snowdonia and the Llyn Peninsula on the way before enjoying a few ales in the Black Lion pub. We had a taxi back and ordered a Thai takeaway , delivered to the door! A great day out enjoyed by the kids and adults and a great weekend enjoyed by all. A family reunion with 4 generations, everyone loved Park Hall with lots to do inside and out, very well equipped with everything you need for a break away for all ages. The booking was simple and straightforward with fantastic communication with Carol and Roger. All the rooms were lovely and comfortable and the bedrooms had fantastic views. I can't recommend Park Hall enough thanks to Roger and Carol, we would all love to go back and try the summer there. Lovely secluded location just a minute or two from the sea and stunning clifftop walks. A great week was had by all despite the weather! We had space to do our own thing and the facilities to get together for family meals - we even managed a BBQ between showers. It was just right for us. Owners lived so close on same site. They were not exactly friendly. Broadband often switched off even though no signal for cell phones. Kitchen on the small side with a step in the middle a potential trip hazard. We returned for a second great family holiday. The house and garden are beautiful and the location superb. The children loved exploring the large house and the enclosed, safe garden complete with hidden path. The proximity of the beach allowed people to come and go without using a car. The bay had everything- sand, rocks and even a stream. Some members of our party were delighted to be investigated by the seals while they were swimming. The bay had very few human visitors making supervision of children in the water very easy. We would wish to alter only one aspect of Park Hall- the internet access.Most of our party are used to unlimited, fast broadband. When it becomes available improved internet access will be the final piece of an otherwise perfect jigsaw. We hope to return again sometime. A lovely property in beautiful surroundings. Since we had several young family members who enjoy Pool we thought it was unreasonable to expect them to pay 50p per game considering the amount we had paid for the week's rent. The kitchen was a bit on the small side when catering for 14 but apart from that it was good. A truly amazing weekend was had at this impressive house in the country. 19 members of our family from various locations around the country descended on this beautiful Welsh seaside location (and the family dogs x3). Beautiful decorated clean rooms all with their own bathrooms (except one), a fantastic dinning room with an enormous table, a games room with a pool table and darts board (in the house and not stuck out In a barn like usual!) a small but extremely well equipped kitchen and two sitting rooms. The walks are beautiful and even the weather was fantastic.....we'll definitely be back. Up there with the best..
5 couples, 20 years of annual March weekend breaks, permanent home in an Area of Outstanding Natural Beauty (..ie , holiday wise, we need a seriously good location! ).So many years of doing ths & we have experienced the good, the bad, and the truly ugly.We've stayed in private lets ( most likely to present with undesirable surprises and prone to economies of truth as regards accomodation, youth hostels ( fun, & mass-catering kitchens but may be a tad on the no-frills side) , National Trust (extremely high standards and very hard to beat)..etc etc. Ok, so this one is very well up there with the 'Good' group. The location is superb, 2 mins walk to the cove, 5 miles in either direction via a fab walk along the cliff path to Newquay, or Llangranog - each having a delightful pub for good lunches, coffee etc. Bedrooms outshine those in National Trust houses, with large doubles, good comfy mattresses & pillows, cosy duvets. Plenty of wardrobe space all round, and (as we were only 5 couples) all had private facilities. Unusually, seating and dining space was generous so we could all sit together. The kitchen is small, but contains everything a group can possibly want - even a juicer! Some minor downsides - Internet is limited, and no mobile signal ( though there is a pay phone) We soon learned to enjoy the peace & did a lot of talking. There is a charge to use the pool table, a deposit required for darts and a damage deposit of £250 ( returned without problem..) - a little taken aback by this as we have never experienced any of this in any other let.We can only assume that somebody must have disrespected this lovely house in the past. Whatever, a beautiful, 'off the radar' place. Really hoping to return, and many thanks to Carol and Roger. There were 13 of us at Park Hall for Christmas 2014, 6 adults,7 children. We all had a great time and felt very relaxed and at home. If we had a problem the owners were quick to help us and were very helpful in many other ways. We have already recommended it to our friends, as finding a house big enough for large families is very difficult, we would definitly go back again.